Read some of my published travel writing here. 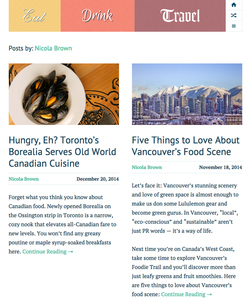 Summary: I am a writer and regular contributor to Eat Drink Travel Magazine. I produce culinary-inspired travel articles informed by my travel experiences in over 19 countries. Target Audience: Young North American travel and food enthusiasts looking for inspiration and information on the world's best culinary travel experiences.